The Group currently owns one ponies, Rhubarb .We buy ponies if necessary but prefer to borrow if possible. 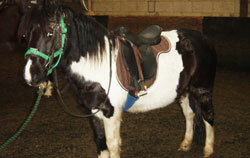 The ponies range in height from 10.2HH to 15.00HH high. All the ponies are thoroughly assessed by our instructors before use .The key ingredients for a good RDA pony are a bombproof, kind, temperament and steady paces, another words they have to be saints. The ponies we are lent spend the rest of their time being family friends and also competition ponies. A number of the ponies we have used over the year will be with us on a Monday and competing or hunting during the rest of the week. In 2005, one of our borrowed ponies, Joe (aka Valentine Heathcliffe ) won the prestigious title of the 133 Cms Working Hunter Pony of the Year at the Horse of the Year Show on the Sunday and was back being an RDA pony the very next day. We take the view that the children riding with our group deserve the best ponies we can secure for them. 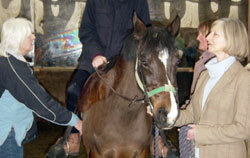 Is a 13.2Welsh Section B Mare. 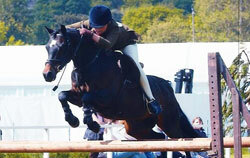 She is one of the last remaining daughters of the famous Stallion, Downland Chevalier. She has had 2 foals and been placed as a working hunter pony at the Horse of the Year Show with the children of two of our volunteers. She has had a foal and will be back soon. 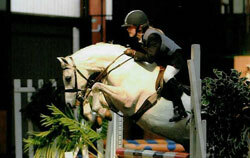 Is a 13 HH irish sports ponywho does not have a bad bone in her . Leo a part Connemara who has been upfront with the VWH,to the pony club championships numerous times and successfully shown .He now indulges in a bit of endurance riding in his free time. Is owned by Eridge RDA and now in a happy retirement home.